It was Oscar night last night. I watched, because I always do. I love the pageantry and pretty dresses. In other years, I've seen many, if not all the nominated movies. This year was different, however. Of the eight movies nominated for Best Picture, I had seen one: The Big Short. If you haven't seen it, I highly recommend the movie for a quick lesson in the collapse of the housing market circa 2008. When I saw the movie on Christmas Day, I cried. It cut too close. Yes, I lived through the housing crisis and yes I kept my home, but my husband and I both worked in land development and suffered lay-offs and pay reductions. We survived, but it hurt. Last night when The Big Short was introduced as a nominee and a clip of the movie played, I cried again. I felt the loss and pain of those people who lost everything, lost the American dream they worked so hard to purchase. Yesterday was especially poignant because I had an Open House first. I visited a home that was being sold as part of a Chapter 7 Bankruptcy. I was not greeted at the door by a realtor eager to make a sale, but a representative from the bank. He did not know anything about the house, and encouraged my husband and I to look around. Most Open Houses I see are trying hard to be sold, with freshly planted flowers, paint, and snacks for the prospective buyers. But this home looked like those Floridian homes depicted in The Big Short. The life of the inhabitants had been stopped midstream. There was lunch half prepared on the counter and the bathroom looked like somebody was still primping themselves before the mirror. In other words, the people who lived there looked like they were home and I was an intruder. The man from the bank complained that the owners were not being compliant or cooperative. I felt sorry for the man trying to have the Open House, but I also felt bad for the owners. The house looked loved and also looked like it was working hard to raise a good family. It did not want to be sold. Whose fault is it? The bank for making a bad loan or the homeowners for not meeting the terms of the loan? After seeing The Big Short it seems like the blame could be placed before the lender, perhaps the loan was too easy to acquire. I thought the collapse of the housing market was over, but after my day yesterday, I just don't know. I usual enjoy the Oscars because the show takes me away from my day to day. I get to sip a nice drink and watch movie stars in action. Yesterday, however that did not happen. My day at the Open House followed by the scenes from The Big Short were too close together, and an unpleasant reality set in. The sun was out, the sky was blue and I visited four open houses this past Sunday. Two of the homes were from the post WWII era (1949 and 1948), one from the 1950's and one from the 1960's. The four Open Houses were in various states of showing, one had been flipped and staged, one was empty, one looked to be a shared rental and one had been de-cluttered and mildly staged with personal belongings. Staging seems to be all the rage, but I must say from visiting the four homes, the house which had only been staged in the living rooms and dining room seemed to have the least soul. When a developer builds a model home and has an interior designer decorate the inside, there are still remnants that remind one of real life such as trophies in the child's bedroom or a grocery list artfully placed in the kitchen. The model homes feel real and one can imagine living in them. A half staged home absent of what would be visible in real life leaves one empty. The home half staged on Sunday was the home built in the 1950's and recently remodeled for a flip. I walked through and was not grabbed or enticed by anything I saw. The two homes built in the late 1940's were opposite in states of showing. One was empty, the other was not polished or Open House ready. The empty home was absolutely darling. The kitchen had black and white tile with original cabinetry off of a dining room with a built in hutch. It seems that at some point in time an owner added a sun porch on the back of the house. Although it was empty, something about the home had charm. If I were in the market, it would be desirable. The home looking like a shared rental taught me that it is imperative to prepare for an Open House. If those that lived in the house had put some things away or stored some furniture in the garage, it may have been easier to imagine the charm. The great room was great, but everything feel apart after that. The last home I visited was a single story ranch home built when ranches were the rage. From the moment I walked in the door, I could tell the owner had undertaken some serious de-cluttering. The house was clean without too much of anything anywhere. There was evidence of toddlers living in the home, but just enough to help one envision this home as a family home. Perfect. Of the four houses visited, the clean ranch home was in the best state of showing and had the most emotional impact. Purchasing a home is an emotional decision. You want the people visiting to have an attachment the moment they walk in the door. If they are distracted by clutter, or not attracted by functional staging, there is not impact and thus no sale. If I had to show an Open House, I would either show it empty or show it clean with small reminders how life is should be lived. 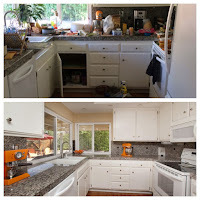 For more observations and tips on Open House Don'ts, please see my guest blog post. I hit the road today and found myself looking at Open Houses in Marin County. For those unfamiliar with the Bay Area, Marin County is the county immediately north of the Golden Gate Bridge. And as one gets closer to the Golden Gate, real estate prices increase, thus the houses today were in the $2 million range. There were two beautiful victorian homes in the Historic Forbes Neighborhood of San Rafael, just a few steps from one another. One home had been completely restored back to its 1889 grandeur complete with antique radiators under each window. Speaking in full hyperbole, the realtor bragged it was one of "the best restored homes in all the Bay Area." I admired each room and walked on. 'Fully modern make over' is the term to best describe the second home on the walking tour. The bathrooms and kitchen were fashioned after what is hot now: marble counter tops, sunflower shower heads, and a Japanese style bathtub. This home had once been the neighborhood eyesore and a contractor purchased it and worked hard to turn the home into something with numerous wow factors. The first wow was the light in the front entry way. Orbital and starlike, the light begged for attention. 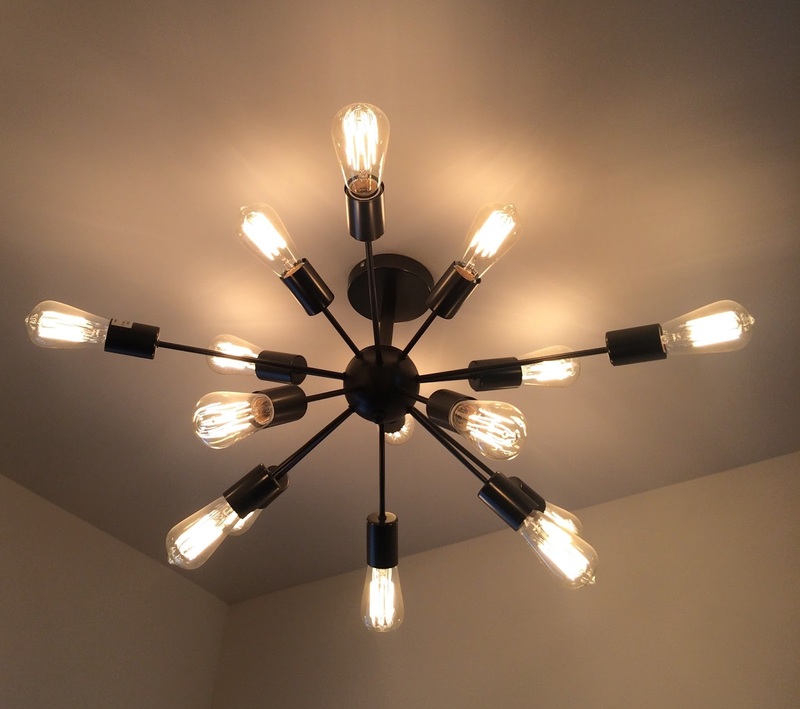 I saw the inspiration for this light fixture last year when I visited an estate in the hills above Sonoma Valley. The estate of Dot and Bill had been built in the 1960's and nothing had been touched or modernized since. I eagerly snapped photos of the wallpaper, light fixtures and patterned carpet, like a museum employee cataloging Brutalist architecture. 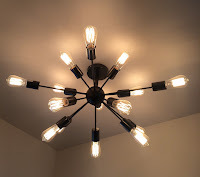 One light fixture in particular kept my attention for days after the Open House; the same starlike light. The stark and bare fixture flooded light in all directions, like a solar flare. The brass fixture stood over a room of shag carpet with blue and green shapes imitating the earth as if the room were a world unto itself. 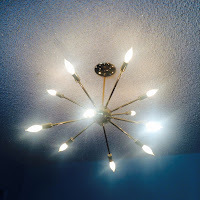 I sent a picture of the light to my father to prove I had traveled back to the 1960's that day. magine my amazement when I found this same light in the entry way of the thoroughly modern makeover in Marin. The Forbes home had been built in 1900, so the light fixture was not there to signify the home's historic past, but perhaps a place holder in between 1900 and 2016.
Who would have an Open House on Super Bowl Sunday? Apparently not too many people. Some Sundays I've had to prioritize my list and never make it to many of the houses that interest me, but today I had two to choose from, and one I had already seen. The house which my husband and I visited in the fall has been on the market for 4 months. It's a brand new home, the last to be built in a subdivision.The builder as included all the modern upgrades that a buyer would want (stainless steel appliances, giant island in the kitchen with granite counter tops and open floor plan), however the home is on a very busy thoroughfare. So busy, the home has been on the market for four months. Down the same busy road, I found today's Open House. The home was built in 1939. The original shape or footrpint of the home was hard to determine. It seems many homeowners since 1939 have wanted to add a room here or there. The result is a home with disjointed rooms that do not quite flow. Somebody has recently bought the property and dressed it up right with new paint, carpet and flooring throughout. The highlight of the home was the giant laundry room. Laundry rooms are many times forgotten. In my home the washer and dryer stand against a wall in the garage. In other homes the room consists of a narrow passage way in front of the washing machines. At the home today, the laundry room was larger than two of the four bedrooms. If one were handy or crafty, this would be a terrific sewing room or craft room. I once read that real estate bargains (for single family homes) could be found along busy roads. The houses today were both well updated, however the price the owners are seeking are not the "busy street" deals I've read about. Time will tell if the owners will get the price that are asking or if the road will force a price reduction.